happier. However, no matter how tempting the sun may be to sit out in it all day, it can be very dangerous if you do not respect it properly. People go on holiday and are only there for a short period of time such as one or two weeks and therefore believe they need to spend every single minute of sunlight trying to get a tan. Ironically, they would get a better, longer lasting tan if they implemented a few simple changes to their sunbathing! Becoming familiar with sun safety and how you can introduce these simple tips whilst you are away, will help you protect yours and your families skin. From 10am – 4pm is said to be the hottest part of the day. This is when the UVB rays are out in force. These rays will make you look like a lobster and are the cause for damaging your skin! However, UVA rays and are out all year round no matter what the weather and these too can also cause of skin damage. Even if it is a cloudy day, rays can still penetrate white clouds. They can also penetrate water up to several metres, so you still need protection. Don’t be fooled that just because you are going skiing you will not need sun protection. 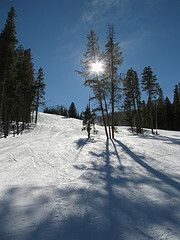 In fact, you can be at a higher risk from the sun when skiing because you are at a higher altitude and closer to the sun, where the air is thinner. The other added danger is that the sun is reflected off the snow which means you are actually receiving a double dose of the harmful UV rays from both directions. Although you may not actually realise you are vulnerable or may not intend to ‘catch the sun’, you are exposed. Yes, you may be well covered when you are skiing but your face is generally exposed the whole time you are on the slopes. Before you leave on your ski holiday, always ensure you pack your sun cream with a high ‘Sun Protection Factor’ and make sure you have a good lip balm with you that also has a sun protection factor in it. Quick short lasting tan and long lasting skin damage? Longer lasting tan and no skin damage? The ‘factors’ allocated to sun cream are only guidelines and as mentioned previ0ously in this guide, the higher factor you choose, the better. These ‘Factors’ are worked out on the length of time you can be exposed to direct sunlight once the sun cream is applied. If you were exposed to direct sunlight without any protection on your skin, how long it would take until your skin burnt? Lets imagine that the time it took your skin to burn without any sun cream was just 20 minutes. Factor 10 = 200 minutes etc.. However, these are only guide lines and it is always advisable to be conservative. Re-applying sun cream does not increase the exposure time but simply maintains it. Do not think that one application of factor 25 will be sufficient for the whole day, make sure you re-apply at regular interval! Everybody’s skin is different and too many people either forget to apply sun cream or think they simply do not need it. They see that other people are not applying any and think they too will be ok. The truth is that everyone need some form of sun protection and regardless of whether tan quickly, you still need protection! The sun produces harmful rays and these will damage your skin if it is exposed for long periods of time. Don’t be silly and remember that too much is better than too little. The fact is, you should apply sun cream to any part of your body that is going to be exposed to the sun. Don’t forget those awkward parts: Ears, bikini line, back of the feet, backs of the knees, angles, neck etc. Yes, there is a difference and don’t get caught out or you will get burnt! If you are in the water, you will catch the sun quickly due to the reflection of the sun from the water. When you are on holiday in a hot climate, the water is very tempting and people can spend long periods of time in the sea or swimming pool. This is even more so for children and if you have children, make sure they are protected before they enter the water and then re-apply once they get out. Waterproof allows you to play in the water for a longer period of time and will give protection for this period of time. It is advisable to re-apply once you have been in the water, do not assume that you will still be protected once you get out of the water. Water Resistant generally means that it will stand a drop of water but will lose a percentage of it’s original factor strength, usually up to half. Don’t go for a long dip and think you will be protected, if you do go for a dip, make it short and re-apply on leaving the water. It only takes a few minutes to re-apply sun cream, take the time and improve your sun safety. Copyright © 2019 Before Travel. Powered by WordPress. Theme: Spacious by ThemeGrill.